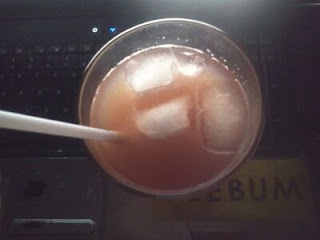 So, I decided to make a nice nightcap cocktail in a nice glass containing rum, cranberry, and pineapple juice. It's definitely a good mix. Very balanced. It's in a tall glass, too. So yeah, you can get the bird eye's view of the drink. LOL. Here are two examples of a Bay Breeze. One with Vodka and the other with Rum. I woulda gotten the Malibu but Cruzan was on sale and it's a much more potent rum than the 21% ALC coming from the Malibu.